This year, I was invited to bring my True North fixed 'cross bike to the Summer Solstice. I would ride as part of the True North company team. This was truly flattering. "Everyone can ride at his or her own pace and just have fun" said Hugh Black, company head honcho. Fun? I know my framebuilder better than that. He rides hard and is very competitive. I resigned myself to working my guts out or facing the team's collective wrath. 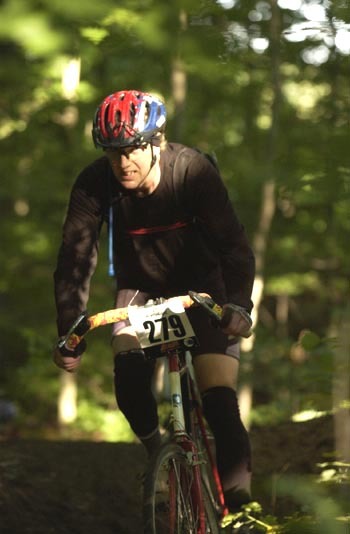 The Solstice is a 24hr race taking in a challenging mix of terrain near the Humber River, to the north of Toronto. For my first lap, I chose a 42x20 gear. The going was brisk, even after I'd stopped to help some poor gearie re-rivet and re-install his bone-dry chain. Fellow team members were bemused by my neophyte trailside generosity. I took the hint. "Live and let die, this is a RACE!" Attacking the longish, gradual doubletrack climbs with renewed gusto, I reeled in more than a few riders. I dropped down to 42x23 for Lap Two. It was a good choice. 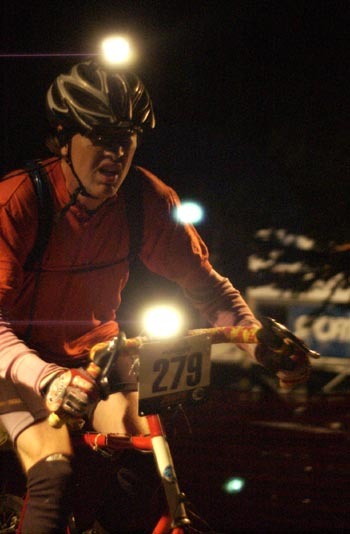 I rode near midnight, over twisting singletrack lit only by dual-source TurboCats. It was a new experience to maintain racing speeds under those conditions, and it changed the way I looked at the terrain. My teammates confirmed my surprised observation: in darkness we bombed up hills, all unawares. In daylight, the same inclines would have slowed us down. The night was clear and cool, and the campfire was a welcome place for stories, warmth and metabolizing adrenalin as the roots around us slickened with the damp. When I lifted my bike down from its perch for Lap Three, just after dawn, I received a ringing endorsement from an observant competitor at the adjoining campsite: "That looks like a death-wish." My startled reply? "I'll have another serving of that!" What could have bothered him? Could it have been my drop bars, 3cm tires, rigid frame and fork, and scrawny steel tubes? As that final lap drew to a close, shafts of sunlight cut through wisps of campfire smoke in the cool, damp morning air. I thought: "I've never before been out on singletrack this early in the morning." We placed 10th out of 108 teams. Just past the finish line, a friend I hadn't seen for 25 years picked me out by my bike. It stood out among the 2,200 others, one of a kind, a delicate dragonfly at a convention of scarab beetles. I rode 50km over the 24hrs, and I've never been so tired. Riding at your limit for 70 minutes, knowing that you'll have several hours to recover, you pace yourself differently. Not long 'til next year! Larry Manuel is based in Kingston, Ontario, Canada. Chico Racing run the Solstice. Last year, Larry wrote on this site about his True North fix. More on Hugh Black's outfit here.